You can choose any branch in your repository to monitor for changes and run deployments from. Add any value you like here that can be used in Variables for substitution into SSH commands or config files. Just use a simple string such as Development, Testing or Production. This might be useful if you're using multiple servers in your project with different environments such as a development and production server so that you can differentiate between the two. 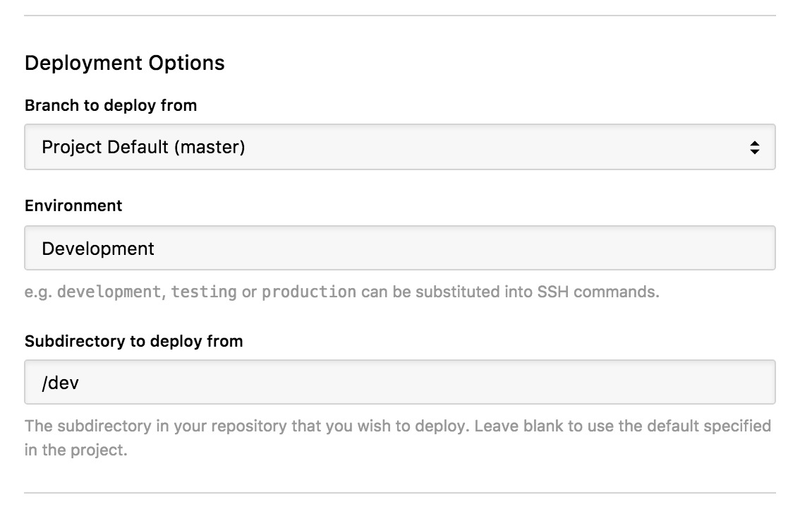 If you want to deploy only a certain directory in your repository, you can choose that option here. You'll need to enter the directory as a relative path starting from the root of the repository itself, for example app, if you wanted to deploy only files contained within your app directory. Any users with global, or full project-level access to this particular project will not be editable here.